Slim ... You haven't by any chance plans on putting a few Sierra Gamekings through your test method have you? Considering I have to buy a box of bullets to do one test, I've avoided the expense. If someone wants to send me 10 each of 0.277 or .308 bullets, I could load up enough to make sure the load is safe and put a couple in the trap. Otherwise, you will have to make a trap and run you own tests. Here's the link to the HuntingNut article on how to do this. that makes those 110s look real promising. now to test them at your 6.8 velocity !!!! now as for that butcher chucking the shoulder !!! give the man the sack !!! that goes in the meat pattie/ sausage pile or just minced up... grrrr I detest waste. Elvis, I wasn't surprise that he pitched the shoulder. It was a mess with a volleyball size exit wound. I wouldn't have wanted to eat it. I've seen some lead-core bullets leave lead flakes all over my bullet trap. I expect this was the case with the disposed shoulder. ok then maaaybe he was right. feed it to the dogs then. That's nuts! Ya gotta tumbler then? Maybe it aint gone to sleep yet and it's yawed jsut enough to flip it on impact? Maybe run a box out to 200y and redo? The real objective today was to get some recoil therapy and compare the terminal performance of the .300 Win Mag my hunting buddy will be carrying next month on our elk hunt with my .270 Win at 500 yards. We both are using Hornady GMX bullets. He is using their off-the-shelf 165gr Superformance ammo and is averaging a muzzle velocity of 3160 fps. I'm handloading the 130 GMX and getting 3070 fps. 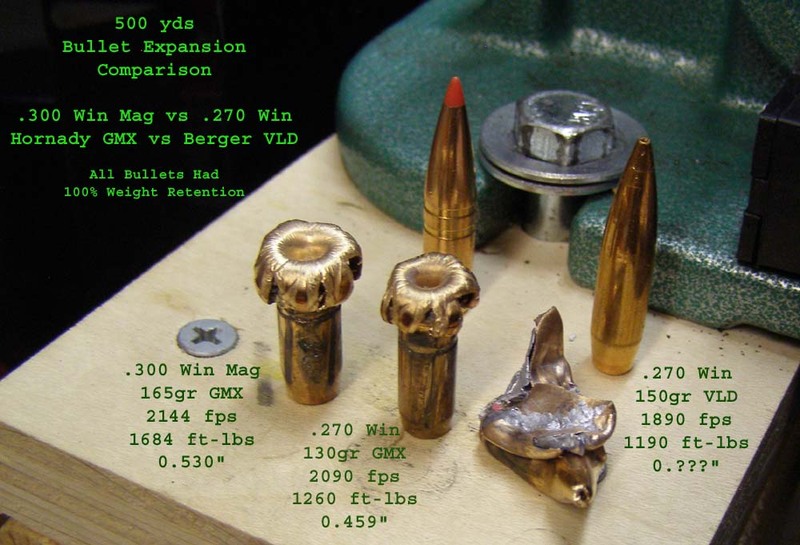 As you can see the .308 bullet expanded to a larger size than the .270. 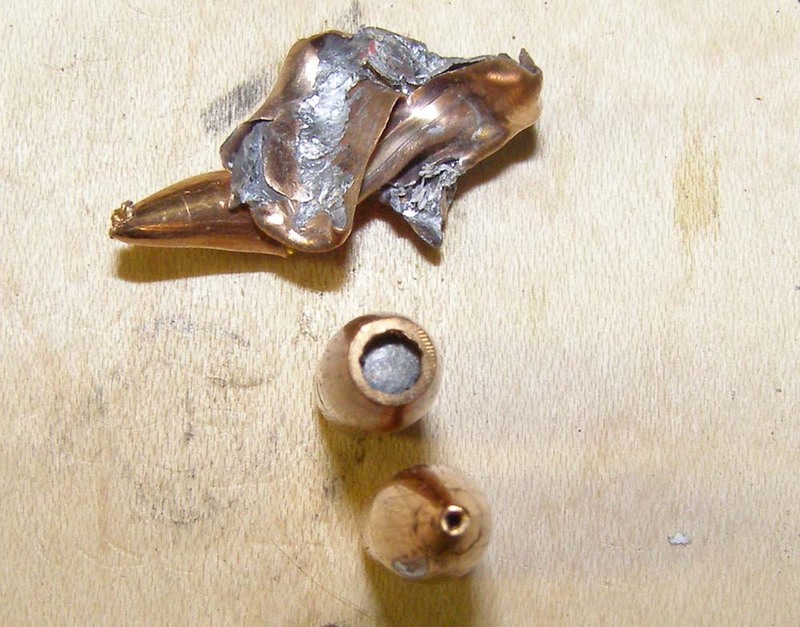 As a result of the smaller diameter, the .270 did penetrate further into the paper box by 5 magazines. The .300 Win Mag is obviously more powerful but I am still getting adequate bullet expansion at 500 yards to "get 'er done". Busting clays at 500 yards with your friend and favorite hunting rifle - priceless! The GMX bullets performed nicely, wonder whats up with the VLDs yawing, do you know what the twist is on the .270 shooting the VLD bullets? wonder whats up with the VLDs yawing, do you know what the twist is on the .270 shooting the VLD bullets? 1 in 10 is required. The 130 GMX is actually More difficult to stabilize because it is lighter and 0.060 longer. I think the jacket is too thick on the VLD. the tip has never deformed in any of my tests. This bullet line is supposed fragment and disintegrate. IMO this particular bullet just doesn't do it. here is a top-down view of the bullet's nose. The center one was put in a vice and cut with a hacksaw. As you can see there was no deformation and the jacket is thick. Note the cut is still above the lead core. There is also another explanation for why the VLD bullet is not fragmenting. My test is not representative of the animals body on impact. You would think, however, that pure water should open that tip up quicker than body tissue. The test certainly is representative for the GMX and TSX bullets as the results I've obtained match exactly with the body damage I've seen on the elk I have shot with the GMX. Interesting Slim, I was over at VLD's site and reading about their bullets a few months ago and went back to revisit as I had an interest in trying these VLD hunting bullets out after hearing so much about them. After doing some reading on their website, they stated "After the bullet starts to expand it will shed 40% to 85% of its weight as shrapnel into the surrounding tissue (internal organ)". Scroll down a little bit till you see Hunting Bullets. OV1, if you want to try some .277 VLDs, I have a deal for you. Just IM me! In general, I don't doubt that Berger VLD hunting bullets do as they say. I just don't think the .277 150gr bullet does. My water jugs have more than 6" depth of water that the bullet must penetrate. Plus, I don't want to buy a roast to test it out on which is the only way i can think of making my test more representative of animal tissue. Thanks for the offer Slim but I don't have the 270 win anymore, #2 son received it as a birthday gift this past March. I started a new topic specifically on 6.8 bullet performance for those interested in how the bullet trap worked for these projectiles. looks like you need to treat those burgers to a detipping with the angle grinder before shooting!!!! !